The Millville Boardwalk site plan, as proposed by Michael McCarthy, includes mini-golf and more. A proposed miniature-golf course and entertainment complex in Millville moved closer to reality on Friday, Feb. 1, when Millville’s Planning & Zoning Committee recommended that the town council approve the project’s preliminary site plan. Michael McCarthy led the presentation of the site plan for the Millville Boardwalk, which will be located on 20 acres to the east of the existing McCarthy Stone business on Route 26. According to the plans presented by McCarthy, speaking as principal of Millville Boardwalk LLC, the project will include an 18-hole miniature-golf course and a building with a raised walkway, or “boardwalk” in front of it. The building would include several shops, including an ice cream shop, McCarthy said. Alongside the building will be a 38-foot-tall lighthouse structure, which McCarthy said he hoped would become a local landmark and something that visitors would see as a sign that they’ve arrived at the beach. McCarthy added that he hopes the complex will become a favorite destination for local residents as well. He said he plans to keep the golf course and the shops open beyond the summer season as one way to serve the local community. He said he envisions a destination in which three generations can find something do to. McCarthy said he also plans to include a playground for smaller children. 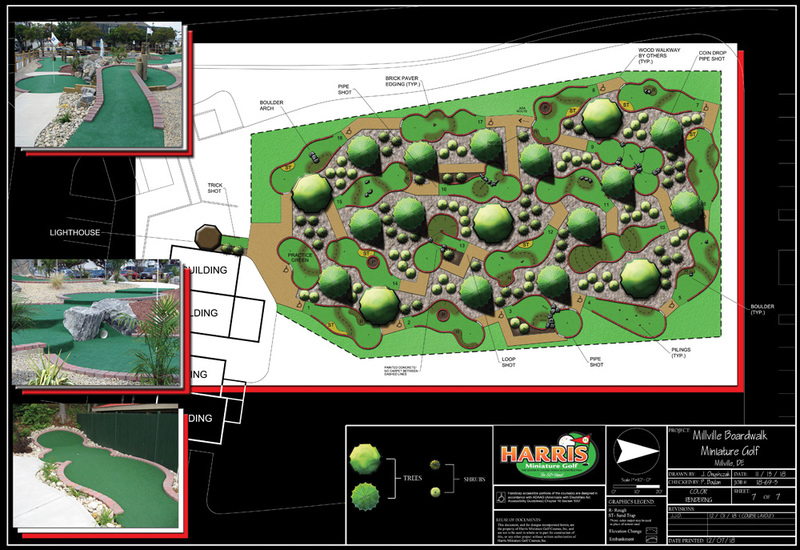 Project partner Joseph Garner said the hope is that the miniature-golf course would open by July of 2019. Thereafter, he said, the businesses would be open from approximately Easter to Halloween, depending on weather. Garner said the design of the course would be “clean” and natural, rather than the “dinosaurs versus UFOs and pirate ships” of some beach-area courses. The theme of the course would be “Delaware beaches,” he said, and it would include surfing, boating and crabbing motifs. Additionally, 10 of the holes will be ADA-accessible, Garner said. Zachary McCarthy said the ice cream shop would be called Agape Creamery — from the Greek agápē, meaning “brotherly love” — and would carry 16 flavors of ice cream, with 12 being permanently offered and four flavors that would rotate throughout the year. The shop will include a small private room that will be available for parties, Zachary McCarthy said. Town Engineer Andrew Lyons Jr. of George, Miles & Buhr said the parking location in the preliminary plan would have to be shifted to the back of the complex in order to comply with town ordinances, and he told the developers that the parking aisles need to be 22 feet wide. He also said the developer needs to submit a plan for signage. Valerie Faden and Vickie York were present at the meeting and addressed issues of environmentally-friendly design and parking, respectively. Evans told Faden that the miniature golf course is “all green space.” Michael McCarthy said the parking area would be paved with clamshells. The committee voted 3-0 to recommend council approval for the final site plan for the project.